United States. 3. Vietnamese Conflict, 1961-1975-Underground movements. I. Title. This study describes the background and implementation of President Lyndon Johnson's decision in May 1967 to create a civil/military organization, Civil Operations and Revolutionary Development; Support--CORDS, to manage US advice and support to the South Vietnamese government's pacification program. It focuses on the years 1966­68 when the organization was conceived and established, and it relates events both from the perspective of government leadership in Washington and the US mission in Saigon. Over these years, the organization changed three times, culminating in CORDS. Each change is examined with special emphasis on the role of important officials, such as General Westmoreland, Ambassador Komer, Secretary of Defense McNamara, and President Johnson. The author served in CORDS from December 1967 to June 1968, while in the US Army, and worked as a historian with the Center of Military History from 1969 to 1972. His extensive first-hand knowledge of the program and personal acquaintance with key figures concerned make this a study of exceptional value. Two volumes, now being prepared for the Center of Military History's series, THE US ARMY IN VIETNAM, will deal comprehensively with all aspects of the US Army's role in pacification. In the interim, this work should prove useful to those interested in the history of the Vietnam war and its administrative problems. Washington, DC JAMES L. COLLINS, JR.
Dr. Thomas Scoville studied history at the University of Virginia and received an M.A. in war studies from the University of London. During 1967 and 1968 he served in Vietnam with a US Army military history detachment and with the headquarters of CORDS. After working with the Center of Military History from 1969 to 1972, Dr. Scoville went to MIT, where he received a Ph.D. in political science. From 1977 to 1981 he was special assistant to the director of the Arms Control and Disarmament Agency and then executive director of the President's General Advisory Committee on Arms Control and Disarmament. He is now director of policy and planning with the joint Maritime Congress. CORDS was unique in that for the first time in the history of the United States, civilians in a wartime field organization commanded military personnel and resources. Its chief, a civilian with ambassadorial rank, became a deputy commander in the controlling military headquarters, serving not as a political adviser and coordinator but as a director, manager, and, in effect, a component commander. managed to preserve their civilian identity and to exercise firm control of the program in support of pacification. The cooperation and tolerance were all the more remarkable after many years of disharmony and uncertainty over how to organize the program. Although the American ambassador in Saigon was charged with overall responsibility for all activities of the US mission, he had to deal with a military commander who was a de facto equal and with officials of three semi-independent civilian agencies: the Agency for International Development (AID), the United States Information Agency, and the CIA. All three agencies maintained staffs in South Vietnam substantially larger than that of the ambassador, and persons under the Department of Defense far outnumbered them all. The US mission was not fully unified. Each agency had its channels of communications to its parent organization in Washington, its own ideas of how the war should be conducted, and statutory authority and responsibilities set down by Congress. The status of the parent organizations in Washington magnified this situation; no one agency, task force, or individual short of the president himself controlled American policy and operations in South Vietnam. The program in support of pacification typified the disunity. In terms of responsibilities, pacification crossed more agency lines than any other program. Yet no agency saw pacification as its central responsibility, and none was willing to let any other take full responsibility for the entire program. This study is an account of how President Johnson reached the decision that brought unity to American support of pacification and how he carried it out. As such, it is a study in organization and management, decisions and implementation, not a judgment of the success or failure of CORDS in helping the South Vietnamese government pacify the countryside. 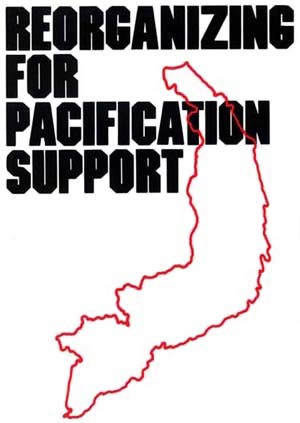 Nor is it a study of pacification as a whole; despite a pervasive and often extremely influential American advisory effort, pacification remained a responsibility of the South Vietnamese. I am grateful to the many participants who helped me through interviews or by granting access to personal and official papers, such as Ambassador William E. Colby, Mr. Charles M. Cooke, Jr., Maj. Paul Miles, Brig. Gen. Robert M. Montague, Jr., and General William C. Westmoreland. I would like to give particular thanks to Ambassador Robert W. Komer whose knowledge, interest, and patience were invaluable. I am also grateful to members of the US Army's Center of Military History, who supported and assisted research and publication : Brig. Gen. Hal C. Pattison; Brig. Gen. James L. Collins, Jr.; Dr. Maurice Matloff'; Col. James F. Ransone, Jr.; Col. John Jessup; Col. James Dunn; Lt. Col. John Pipkin; Dr. Richard Hunt; Mr. Vincent Demma; and Dr. Ronald Spector. Mr. Charles B. MacDonald, then chief of the Current History Branch, was a continuing source of assistance arid inspiration, and I owe a special debt for his helpful suggestions. Illustrations are from Department of Defense files except the photographs on pages 21 and 52 which are from the Lyndon Baines Johnson Library, National Archives and Records Service; on pages 8, 18, and 50 from the Department of State; and on page 81 from the Central Intelligence Agency.